I will admit that I had not heard of Trulon: The Shadow Engine before its PC release. Once I saw it was an RPG that used a card system in its turn-based fights, I was interested in trying it out. As a fan of both collectible card games and role-playing games, I have enjoyed the other mashups I've tried. Repeat readers of my reviews may know that I love sprites and 16-bit looks to games. Trulon pulls it off very well, and even has some nice animations. The way the characters move and animate is really cool looking. When you activate a card, it shows a more close-up view that reminds me of the pre-battle animations in Pokemon. There are a few different attack animations based on which card you use. It would be nice if all the different types of cards got unique animations, at least for the party members, but having as many as they do is nice. When battle starts, you are given a few cards (called Tactics) from your character's deck on the bottom left side of the screen. The bottom right side has a wildcard and the standard attack (these will replenish). Every time your turn comes up, you will draw another card. You can run out of cards in your deck, but will always be able to use a wildcard and the default attack. To use a card, you drag it to the target. The animation plays and it shows the damage done (or other effect). Simple and it gets the job done, but there is strategy involved in when to use certain cards, as they may allow more cards to be played, or affect attack and defense. Your party members can also equip up to three items to boost their stats or give other effects. Many are typical "give x HP, Str, etc. ", but some will give bonuses depending on cards used during combat. At a certain point in the game, it will randomly assign cards as an "Assault Tactic", noted by the lightning bolt on it. The equipment pieces that affect these can be very useful, giving you a small heal, stunning opponents and more, just for using the right card. 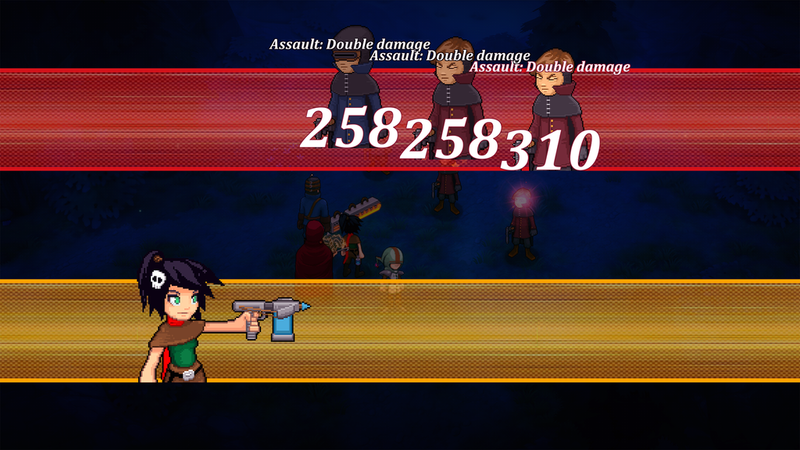 It's easy to switch equipment, which is good since it pays to play around with your loadout and figure out what is most effective for your playstyle. Admittedly, battles are harder than I thought they would be. I usually wipe out the weaker enemies first, then the stronger, but most times the opposite seems more effective in Trulon. Some enemies can do a lot of damage, and you need to eliminate them fast or have a cards that mitigate the threat. 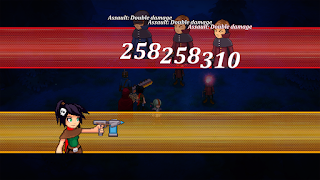 Part of the difficulty is due to the card-based battle system. You might have the right attacks for the situation, but you have to have them in your hand to be of any use. It adds a random element to the battles that I'm not too fond of. I prefer reliability in my RPG fights, but the card system is still fun. At least if you lose a fight, it puts you back right before that, so there isn't a whole lot of pressure, just some wasted time. At least you aren't severely punished for something that is largely out of your control. On the world map, in a town, or exploring a dungeon is done by clicking where you want to go. The world map doesn't always point you in the right direction, but the areas aren't too big so you shouldn't get lost much. While moving around it, there are also random locations of interest. While these are mostly fights, there are some that are just items. The player is free to skip these, and can even walk out of them if you don't like the enemies present. In dungeons, the enemies sit around at various places, so you can see what you are going to fight. They don't really respawn, either, so you will have to fight on the world map if you want to grind. Grinding isn't really necessary if you are careful about what cards and equipment you carry into battle. The story is interesting enough, but the game is a little on the short side for an RPG. There's even an achievement for beating it in under 5 hours if you are so inclined (this would be best to do after a first run). The save system in the game is not ideal for me. I looked through the menus to find a save option, and even scoured the town, thinking the game may use old school save points. Nope. The game saves when you exit it, and automatically at various points. While not my preferred method of saving, I didn't have the autosave mess up on me, which really helped me out when I had a soft-lock bug while playing. Trulon: The Shadow Engine is a pretty fun, but short, RPG. The card-based fights is the game's biggest strength, making it very unique. It is also its biggest weakness, making the fights much more random, longer and more difficulty than they have to be. Either way, I had fun guiding Gladia and her compatriots on their adventure. I really like the character animations. The card-based fights are innovative and unique. However, they (the card-based fights) are also too random. Many times I know I have the card I need in my deck, but I don't have it in my hand, making the battle take longer than it normally should. Sometimes going back to a previous area would cause dialogue scenes to replay. While that did help me get two of the achievements, that should probably be fixed.